Liebherr launches its first purely electrical port crane, with higher bulk turnover than comparable electrical driven cranes in the market. Rostock (Germany), April 2018 – The new LPS 420 E is the latest extension of the Liebherr mobile harbour crane product range. The newly designed machine is a purely electric driven portal crane. All crane movements like luffing, hoisting, slewing and travelling are done by electric motors. As the LPS 420 E is a member of the LHM series, it is also characterised by high modularity. Therefore, it is a universal all-rounder and a key asset for handling every type of cargo, from containers to bulk, general cargo and heavy lifts up to 124 t. The forward- looking machine is designed for ports and terminals with an electrical infrastructure. Equipped with two winches, each with a powerful 190 kW electric motor, the LPS 420 E provides a maximum load capacity of up to 124 tonnes. Therefore, the portal crane can be perfectly used for heavy break bulk as well as project and general cargo. The LPS 420 E is especially optimised for terminals with a power supply ranging from 380 V to 460 V. Thanks to the Liebherr active-front-end frequency converter deviations in the voltage supply can be compensated easily for safe and stable operation. Due to the critical conditions, like limited space and harsh environmental conditions, a liquid- cooled and highly efficient multi-drive frequency converter system was implemented. 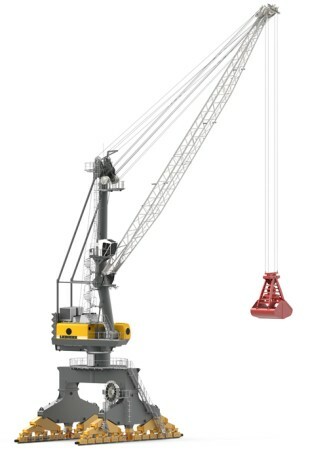 The frequency converters are Liebherr built components, which have proven themselves in Liebherr ship-to-shore gantry cranes and material handlers. As an additional benefit, Liebherr energy storage units can be used to reduce the peak-load in the crane main power supply and to take advantage of regenerative energy within the system. The compact unit ensures a high power storage capacity, which enables the accumulation and supply of 200 kW of power within 15 seconds.